Don’t Mind Me by Judith Haire is a memoir about the deep descent into psychosis and the long struggle to find mental health in the aftermath. It is one woman’s true story of finding herself at the bottom of a well of insanity, with nothing but her own wits to get her to surface to sanity. Ms. Haire describes a history of generations of hostile family relationships, including those of her grandparents. Then, she delves into the unsatisfying marriage of her parents, which made her feel unwanted. Her father’s moods alternated from violent to withdrawn, while her mother distanced herself from emotional commitment toward her child. Ms. Haire’s painful childhood left her bereft of the nurturing children require to grow to healthy adults. As is often the case, she repeats the patterns of helplessness and hopelessness by marrying a man who used and abused her. She described herself as “mentally destroyed.” Having no support, Ms. Haire became vulnerable to a psychotic break. Ms. Haire’s treatment appeared to lack compassion; she was often ignored, under-medicated, over-medicated, misunderstood, and isolated. It seemed to be the commitment of the patient herself that moved her mind through psychosis. Step by step she took on challenges that lead to a healthy life with a fulfilling relationship. She’s firm in her belief that even an unborn child can take on the stressors of the parents. This theory helps Ms. Haire to have compassion for herself. 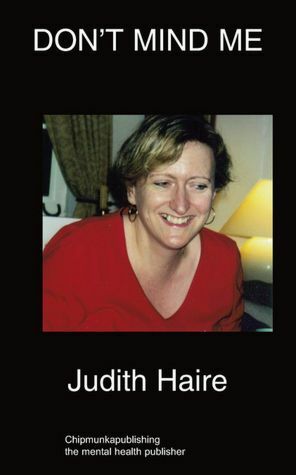 Judith Haire says she found catharsis in writing Don’t Mind Me. She offers resources for mental health clinicians and patients alike. Most importantly, she shares a personal story that helps to reduce the stigma of mental illness by increasing the understanding society needs to protect vulnerable citizens.